If you do not have any big boat experience, we recommend you take the OSS 103/104 Live Aboard Course on a monohull first so you learn the techniques of sailing a large yacht. On a monohull you “feel” the force of the wind as it fills your sails far more than on a catamaran, and are able to practice and see the results of applying seamanship skills to reduce sail when the boat seems overpowered. Catamarans are, indeed, the choice of many new cruising sailors because they have more room, and will not heel (lean over) like monohulls do when the wind pipes up. The choice is yours, of course. Only a maximum of four students per week may reserve cabins to learn on our impressive yachts. Don’t wait to sign up to reserve a spot on one of our cruising sailboats! During the six-day live aboard sailing lessons program you gain incredible knowledge and skills that qualify you for chartering and handling big cruising boats and bareboat cruising on your own. From docking and anchoring, to picking up moorings and maneuvering in crowded harbors, to quick actions in heavy weather, this is the ultimate learning vacation. You do all the cooking and cleaning up, just like you would if you were bareboat chartering (skippering the boat without hired crew). There is no chef and the instructors do not cook your meals. Cooking aboard is part of the learning process. like to relax ashore a day or two before the course starts or after it ends, we are happy to make those arrangements for you. 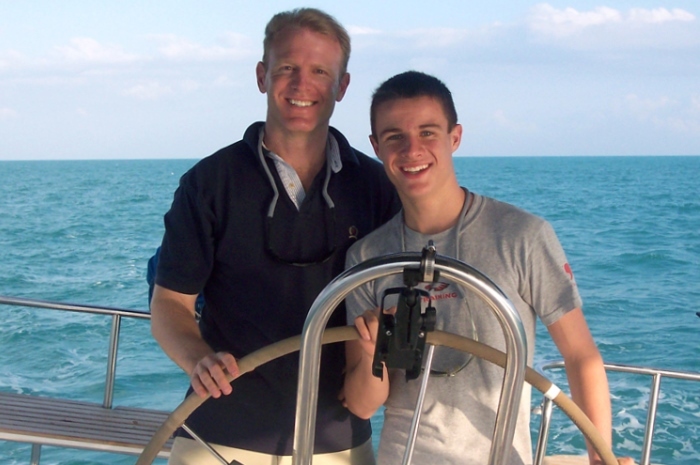 We also offer packages for live aboard family sailing! Get in touch to learn more about our yacht and catamaran sailing lessons. For those who have strong basic sailing skills, with US Sailing Certification, our handsome cruising yachts are the perfect platform to gain confidence and knowledge handling big monohulls. The Live Aboard Cruising course in Florida is taught on 43′ to 44′ monohulls, and 40′ catamarans. In the British Virgin Islands it is taught on a 51′ monohull, and 39′ to 48′ catamarans. Click here to learn more about the Offshore Sailing School fleet. See more details below in Where to Learn. LIFE! My dream to sail only started about 6 months ago and as a goal orientated person (US Air Force for 26 years) I knew there would be no better way to move forward than to take a sailing course. Sure it was challenging, it was tough, but it was a lot of fun. I highly recommend this course to anyone who wants to sail, or to anyone wanting to check off a bucket list item. Both of our instructors were excellent. They had incredible knowledge, patience and solid teaching techniques. Both boats were in impeccable condition. I had a lot riding on this course as if my wife didn’t like it, my dream to live aboard someday would have been crushed. Thank you, thank you! 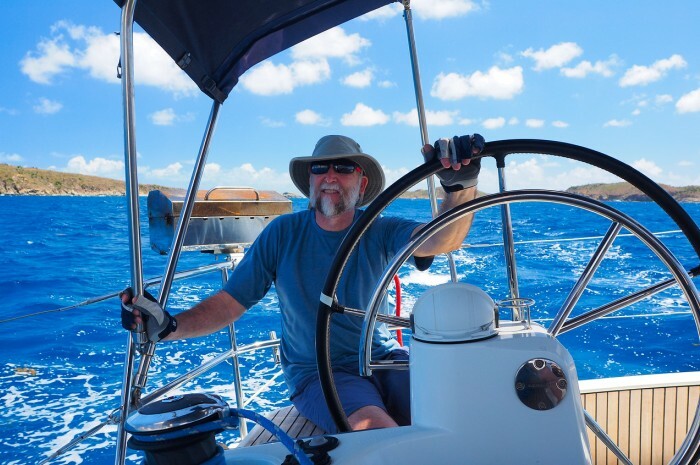 The Live Aboard Cruising course assumes you already have US Sailing Basic Keelboat Certification and are ready to learn the techniques and skills for handling larger sailboats and bareboat cruising (chartering without a hired skipper). If you do not have US Sailing Basic Keelboat Certification but do have equivalent experience on sailboats of at least 26 feet with skippering and crewing experience. you will need to take the US Sailing Basic Keelboat test (additional fee of $75) prior to taking the US Sailing Basic Cruising and Bareboat Cruising tests during the course. School. Just finished the Catamaran Live Aboard Cruising Course (that’s me in the yellow shirt on the right). It’s been an awesome adventure and experience. Instructors are awesome!! Lots of knowledge and experience where you can’t find anywhere in books. Our instructor had so much knowledge I thought I was a brand new student, talking to Jedi Master YODA!! The Live Aboard Cruising Course is taught on 43’-51’ monohulls or 39′ to 48’ catamarans. In the British Virgin Islands, you sail on a beautiful Moorings 51.4 – fifty feet of sheer cruising fun. Because of the popularity of our live aboard sailing courses call early and have several dates in mind, especially if you are interested in live aboard family sailing packages. The 246-page Fast Track to Cruising course companion book is sent to you in advance to study. Close, personalized instruction is provided by an expert live aboard sailing instructor with you throughout the first five days. See the Course Schedules tab below for more details. 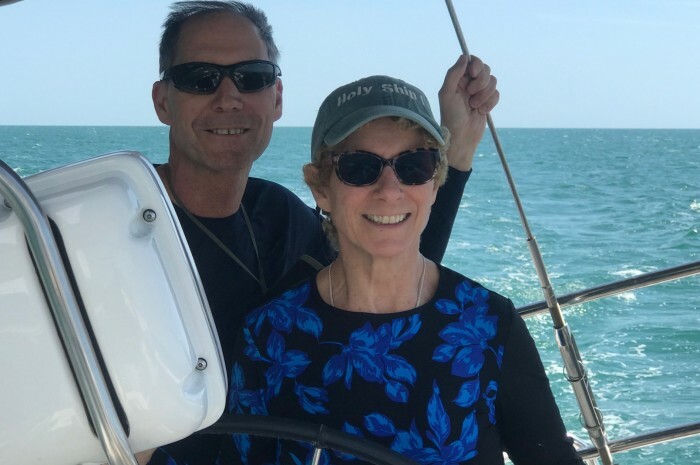 If you are planning a live aboard family sailing vacation, ask about “Buying the Boat” for a private experience in our live aboard sailing school. 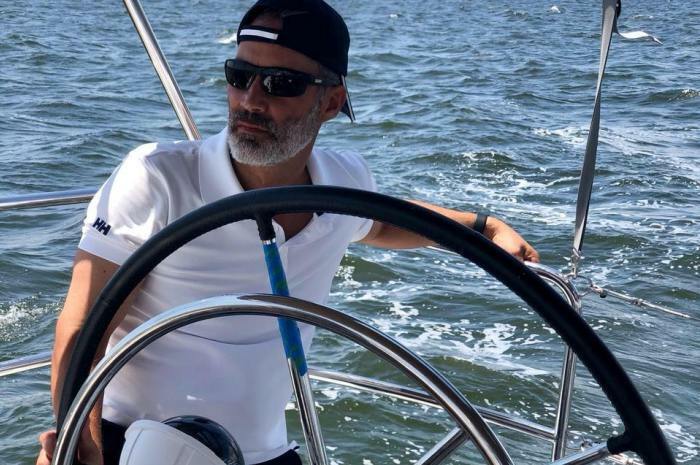 Though we normally teach no more than four aboard a boat, we can take up to six in Private Courses if everyone has good basic sailing experience. Private Live Aboard Cruising Courses for Two are also available. Singles and couples living aboard are paired with others in the same course. Often lasting friendships are formed, with classmates cruising together after the course. Your home and classroom is a beautiful cruising monohull or catamaran with three or four cabins, a generous main salon and galley area, hot water showers, swim deck and shower, spacious cockpit, air conditioning (in Florida) and all the equipment you need for safe, successful big boat handling. Offshore Sailing School has been the exclusive sailing school for The Moorings, the most prominent charter company in the world for over 38 years. We have an exceptional yacht in our fleet here – the Moorings 51.4, fifty-one feet of sheer cruising fun. Offshore Sailing School cruising course graduates are now “Captains” in The Moorings preferred charter program. If you take this course in the British Virgin Islands with family or friends, why not continue your cruising adventure with a charter vacation right after you graduate? For a seamless getaway package, we can add that charter to your live aboard cruising sailing lessons in your vacation package at your Offshore Sailing School discounted Moorings Captain’s charter fee. Just tell your sailing adviser when you sign up for the course that you want to extend your learning experience with a do-it-yourself bareboat charter cruise! Most charter agencies do not allow night sailing and require that you are anchored, docked or on a mooring before sunset. Night sailing is not covered in this course, but is covered in Passage Making courses, the next step in your learning process. A Live Aboard Cruising Course – whether on a monohull or catamaran – prepares you for charter cruising on your own, without professional captain and crew aboard (called Bareboat Cruising by charter companies). Cooking aboard is part of the learning process.You do all the cooking and cleaning up, just like you would if you were bareboat chartering. There is no chef and the instructors do not cook your meals. Depending on weather conditions and the learning pace of all in your class (maximum four per boat per instructor unless you opt for a Private Family Course), the following knowledge and skills will be learned and practiced during your live aboard cruising sailing lessons. Certifications: Colgate Coastal Cruising and Colgate Bareboat Cruising Certifications come with this course, when you pass those tests. US Sailing Basic Cruising and Bareboat Cruising certifications are available for a fee of $150 per person, paid at the time you sign up for course. If you opt for US Sailing certification, the US Sailing Basic Cruising and Bareboat Cruising textbooks are sent in advance in addition to the Fast Track to Cruising textbook. Certification testing will then be based on the US Sailing books. Package rates vary by season and location, and include all the elements listed below. Not included are meals ashore, travel and other expenses you may incur. Please call 888-454-7015 for a quote. Offshore Sailing School knows we cannot thrive without great employees and products. All graduates are asked to fill out an evaluation at the end of the course. The following testimonials come from those evaluations and individual correspondence with recent graduates of the Living Aboard Cruising Course. Many are happy to correspond by email or phone with you. If you would like us to put you in touch with anyone below, please call 888-454-7015 or email sail@OffshoreSailing.com. This was my first experience with a catamaran and I am impressed with how much we all were able to learn on a compressed time schedule. I am very pleased to feel confident about handling a cruise in a 14 ton cat! My experience was worth every penny. Jim was everything I would want from a sailing instructor and leader. I have done a fair amount of outdoor schooling and he ranks very high in my book. I would recommend the course without hesitation. Neil has been the most terrific instructor I have met in my sailing experience. (I was a sailing instructor for small boats as well and I can definitively judge this aspect.) The course was incredibly fun and well-structured. His level of knowledge is incredible and he was able to share his experiences and taught us the practical skills. Everything about my live aboard cruising course exceeded my expectations. Great sailing, the navigation and itinerary between islands were very well prepared, outstanding course content and sailing practice. Rick Hinman was extremely knowledgeable, professional, patient, and all around great guy. He taught so thoroughly and eased my anxiety with his patience and humor. It was an amazing course!! My classroom was a cruising sailboat. We sailed among manatees, dolphins, egrets, falcons and herons. I am a new owner of a sailboat and am eager to try everything I learned at Offshore Sailing School this summer. My wife and I really enjoyed our Offshore Sailing experience. It did, indeed, exceed our expectations. The BVI is a beautiful place to learn. Our two fellow onboard students were pleasant to be with. Importantly, Amanda, our instructor, made learning fun. She was delightful, an excellent instructor, and we learned a lot from her. Neil was amazing – knowledgeable, great teacher, we had a blast. 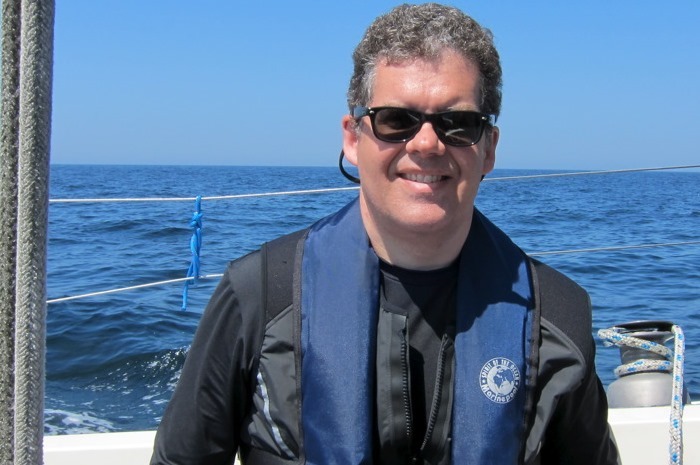 Over all experience: Terrific course – I’m now ready to take a boat out on my own! We have taken Offshore courses and sailed the BVIs with 6 captains. Our entire family, kids included, said that Dutch (Neil) was the best captain, instructor and companion ever! We learned a lot and had a terrific experience. The course exceeded my expectations. 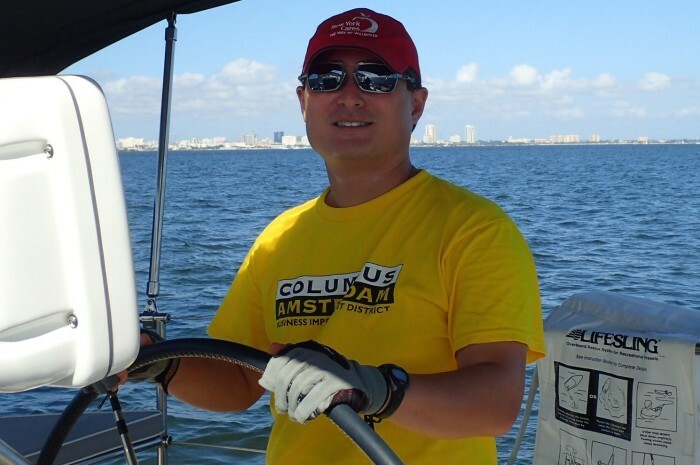 I have some experience as sailing crew and was nervous that I would slow the class down. I learned a lot and am now more confident. I would recommend this course enthusiastically. We had an amazing six days on our live aboard! Would highly recommend this course! We learned so much and had fun at the same time. Simply amazing. Amazing experience! Garren was excellent. He put my wife at ease as it was her first time on a live aboard. His technical knowledge and practical application of it is fantastic. A great week was had by all! Our family did the Live Aboard for our 13 year old son’s spring break. We wanted to learn how to sail the bigger boats so that we could cruise as a family. 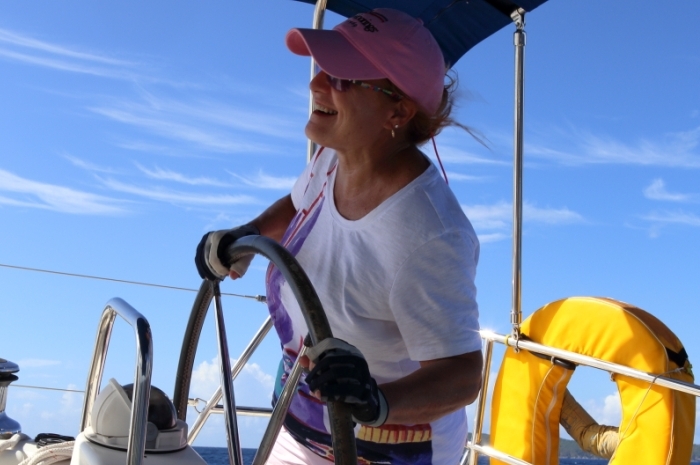 The live-aboard course allowed us to really learn and understand what it is like to bareboat. A 50 ft. sailboat is daunting but now we know we can handle it. We look forward to cruising in the BVI as a family. Jim was great. The weather was rough the first couple of days (20-25 knots gusting to 35) and he helped us make the best of it. If you can dock in that weather, you can do it in lots of situations. The rest of the week went very well. Hard work but worth it. My wife and I learned a lot. The feeling of satisfaction and accomplishment after taking the boat out and back on the last day was the perfect end to the week. When I began I never handled a boat (sail or power) and by the end of the week I was sailing and maneuvering a 40’ boat out of a dock. Great learning experience! I could never imagine how much I would learn in such a short period of time. We were amazed at the end of the week by how much we had learned. Excellent experience. Looking forward to taking another class. Outstanding instruction, quality sailboat, and great winds in the BVI. We learned a great deal and had loads of fun! Our instructor was fantastic! Lots of knowledge, experience and patience! He definitely made the catamaran sailing course really fun and interesting. I highly recommend anyone interested in sailing to learn in the British Virgin Islands at Offshore Sailing School. Fantastic time! Just came back from the British Virgin Islands on our maiden voyage after taking the Fast Track to Catamaran Cruising course!! Took two of our 3 boys and one of the girlfriends. Very proud of our accomplishment. Thanks for all the great training!! A terrific experience. I look forward to opportunities to continue sailing both through the Offshore Sailing Club and other activities, flotillas or future classes. Offshore is a great school to take you from no sailing experience to a competent live-aboard sailor in a week!